PRODUCT SHEET StyleView® 43 (SV43) – Non-Powered Medication Delivery Cart with Drawers Highlights • ffortlessly maneuver to the point E of need with ultra-smooth gliding casters • rgonomically accommodates the E widest height range of users when sitting or standing • ffers effortless sit-stand height O adjustment using patented Constant Force™ technology • Compact footprint fits in spaceconstrained areas • rings simple and efficient medicaB tion management to the point-of-care with an auto-locking drawer system that stores PINs for up to 1,000 users with StyleLink™ SKY software • rawer system supports “pharmacy D mode,” allowing all drawers to be unlocked simultaneously Choose the StyleView medical cart that best meets your caregiving needs, style and workflow. 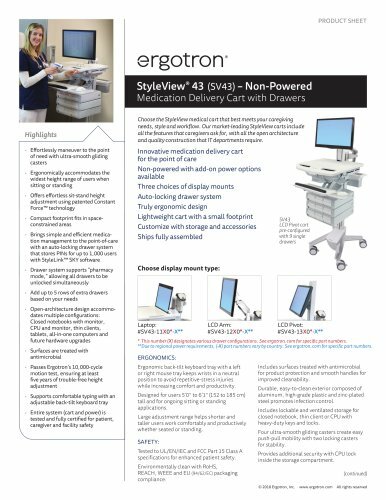 Our market-leading StyleView carts include all the features that caregivers ask for, with all the open architecture and quality construction that IT departments require. Innovative medication delivery cart for the point of care Non-powered with add-on power options available Three choices of display mounts Auto-locking drawer system Truly ergonomic design Lightweight cart with a small footprint Customize with storage and accessories Ships fully assembled SV43 LCD Pivot cart pre-configured with 9 single drawers Choose display mount type: • dd up to 5 rows of extra drawers A based on your needs • pen-architecture design accommoO dates multiple configurations: Closed notebooks with monitor, CPU and monitor, thin clients, tablets, all-in-one computers and future hardware upgrades • urfaces are treated with S antimicrobial • asses Ergotron’s 10,000-cycle P motion test, ensuring at least five years of trouble-free height adjustment • upports comfortable typing with an S adjustable back-tilt keyboard tray • ntire system (cart and power) is E tested and fully certified for patient, caregiver and facility safety * This number (X) designates various drawer configurations. See ergotron.com for specific part numbers. **Due to regional power requirements, (-X) part numbers vary by country. See ergotron.com for specific part numbers. ERGONOMICS: Ergonomic back-tilt keyboard tray with a left or right mouse tray keeps wrists in a neutral position to avoid repetitive-stress injuries while increasing comfort and productivity. Designed for users 5’0" to 6’1" (152 to 185 cm) tall and for ongoing sitting or standing applications. Large adjustment range helps shorter and taller users work comfortably and productively whether seated or standing. SAFETY: Tested to UL/EN/IEC and FCC Part 15 Class A specifications for enhanced patient safety. Environmentally clean with RoHS, REACH, WEEE and EU (94/62/EC) packaging compliance. Includes surfaces treated with antimicrobial for product protection and smooth handles for improved cleanability. Durable, easy-to-clean exterior composed of aluminum, high-grade plastic and zinc-plated steel promotes infection control. Includes lockable and ventilated storage for closed notebook, thin client or CPU with heavy-duty keys and locks. Four ultra-smooth gliding casters create easy push-pull mobility with two locking casters for stability. Provides additional security with CPU lock inside the storage compartment. (continued) © 2018 Ergotron, Inc.